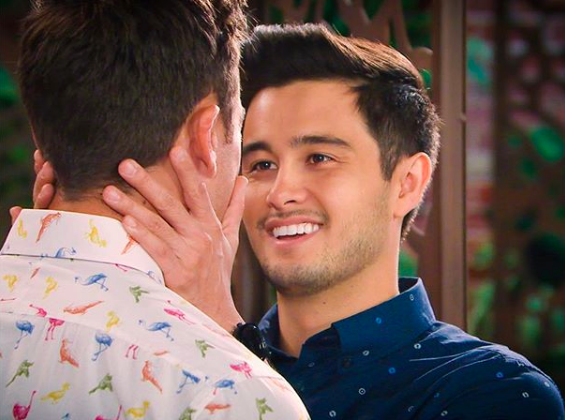 Takaya Honda and Matt Wilson play boyfriends on the beloved Australian soap Neighbours. Over the weekend, they made an appearance at Sydney’s Gay & Lesbian Mardi Gras, where they greeted fans and answered questions from media. Afterwards, 31-year-old Honda, who is straight, took to Instagram to address the question he gets asked far more often than he would like. “We get asked, more often than I think we should, ‘what’s it like to play a gay character as a straight actor, do you find it difficult?’” he wrote. Honda went on to say that there is “no degree of difficulty added” simply because a character is gay. We get asked, more often than I think we should, “what’s it like to play a gay character as a straight actor, do you find it difficult?”. Firstly, who could find it hard to play gay opposite this incredible man? Secondly, #LoveisLove, our jobs, as actors is to communicate a story by adopting the lives of the characters we play. Who they are attracted to is only one part of who they are. Everyone understands love and most have an intimate understanding of what true romantic love is. The task we are given is to evoke within the audience that feeling of love and have them believe that we are in love, and that would go whether our characters were gay, straight or other. There is no degree of difficulty added because these characters are gay. This is our job and we work bloody hard to do it the best we can – with the hope of honoring the story we have been given the responsibility of telling. Finally, the love I felt last night at @sydneymardigras was overwhelming and that love filled energy had no sexuality or gender. Love is universal and transcends boundaries. I hope that the love between David and Aaron feels real for you all and that as that love grows and is tested that @mattywilson and I continue to make you believe in #Daaron #?? #???? #?? #mardigras2019 #love #everyoneiswelcomeonramsaystreet @neighbours Thanks @rubymchaffie for the ? But not everyone seemed to agree with the actor’s stance. To which Honda responded by doubling down on his position. “I hope I no one is ever asked their sexuality for a casting, it would be completely inappropriate and an awful practice that would likely have dire negative, not positive, effects,” he said. Bored with all of the pearl clutching that somewhere, at sometime in the future there MIGHT Be a straight actor who may miss out on a gay role. How about we wait until LGBT actors aren’t routinely screened out of roles and actually have a chance at them before we worry that some straight actor in a future date might be sad. Lovely bit of drivel. Actors who fit a role should not be screened simply on the basis of sexual identity any more than on race, religion etc. The fact that gay actors are discriminated against does not justify discrimination against straight actors. You would know. You’re the king troll of drivel. Translation: You are ok with the continued discrimination of LGBT actors…..ok, got it. @DCguy.. Yeah bored with all the ‘effin pearl clutching by queers like you. The best actor should get the job. Gay actors should play str8 characters–the good ones have been doing it for years–gay one’s straight. etc. Jaunjo specifically stated that is not what he believes. I assume Mr. Honda is talking about racial discrimination which I don’t doubt for a second he’s experienced especially as an actor. However his experiences with racism are not the same as homophobia even though the hateful rhetoric is framed similarly. The issue has never been about straight actors playing gay it’s that there have been many openly gay actors kept from playing straight and pushed into gay roles only to have to compete with straight actors for those same roles they are pushed into and then those straight actors treated like them portraying the role is some kind of bravery they should be lauded for. He needs to talk to the boyfriend twins so he’ll know real pain. Those 20 year old Instagram twinks have been through hell because of their sexuality! I would argue that his experiences with direct discrimination and racism in casting are possibly harder since many gay actors choose to or are told to hide their sexuality; he can’t hide his race. Isn’t it odd that the same commenters who would say their sexuality is only a part of who they are and not the singular defining characteristic of their personalities seem to be the same one who are angry that a straight actor said the same about a FICTIONAL CHARACTER? Queerty should stop this click bait headlines, when i read it i expected to read some outrageous or out of touch comment, but what this actor said is totally right. And actor’s job is to play a role and do justice to their character. I would love to watch more openly gay actors (there are some really good) getting roles, and it would be nice if they get some prominent gay roles too (this years oscars show that’s not happening, a lot of gay roles nominated but zero openly gay actors), but as long as the actor is comfortable with the role (i’m a little tired of insecure actors who feel the need to mention their girlfriend in every sentence of every interview, and the ones uncomfortable with the attention of gay fans, etc) i couldn’t care less if the actor is gay or straight. As Lauren Bacall once said, “This world doesn’t own you a damn thing.” That includes gay and straight and trans actors, or anyone. Just another stupid thing for the perpetually outraged to be outraged over. I just saw another article about people complaining about Will Smith being cast as the Williams sisters father because he is not the right shade of black. I guess we can look forward to the day when we are complaining about gay actors being cast in gay roles because they’re too butch to play someone like Paul Lynde. Yay progress. For a “straight guy” he sure has a serious case of gay face. For 30 years Neighbours resisted any kind of recognition of gay characters. They couldn’t even be bothered standing up for marriage equality during the nationwide debate before the vote. But now they’re flying the rainbow flag as though they’ve always been at the forefront of gay rights. It’s pathetic really, the worst kind of jumping on the bandwagon after everyone else has shown what real courage and social advocacy looks like. I remember when it was considered risky (and in fact, in some cases, was) for a straight actor to play a gay role. And I appreciated them for it. Not because they were “doing us some favor” by portraying a gay role; but for expanding their mind to realize just how similar we all, gay or straight, can actually be to each other. Sure some played it a bit camp, but some of us ARE a bit camp. I think it’s ridiculous that we are having this conversation and not others. I would hate to see a gay actor be turned down for a straight role simply because of his sexuality; and honestly, vice versa. I think it’s important to have greater visibility for gay actors; but not at the expense of perpetrating the same bigotry that has kept them from pursuing most of the roles available on the stage or screen. I am far more concerned with the performance than the performer when it comes to media representation of the LGBT community. And how Queerty can speak on this with a straight face is beyond me. Whether it’s their Instagram-related posts or another cute, straight thirst trap; this site is not exactly the bastion of 100% gay-only promotion. Not saying that it should be exactly. But come, on, Queerty, really??? Then Philadelphia got made and str8 playing gay/trans became a quick trip the Academy Awards. …he doesn’t really look straight enough to play straight! Actors engage in professional make-believe. If only gay actors can play gay roles, then only straight actors should get to play straight roles. I don’t care about any of it, just make an entertaining / captivating show! Relax. He never said he was more discriminated against than you have been. The industry of “make believe” isn’t very good at understanding the craft of *make believe*. If you play a gay character, the industry tends to typecast you and the only calls for work you get are for other gay roles. It is ridiculous.